Summertime is by far my favorite season. I can’t get enough of time at the pool, cookouts, sunshine, and warmth! Beyond these summertime favorites, I also love camping. And, this was something that I have always dreamed of doing when I finally had a family of my own. Luckily, my husband is just as enthusiastic about the idea of getting out in the wilderness. So, over the past few months, we’ve been slowly buying and gathering camp gear. We figured that Graci (who was over ten months old at the time) would be big enough to try camping. When we prepared, we kept the fact that we would be camping with a baby in the forefront of our mind. A few weeks ago, we decided to head out for a one-night camping trip about an hour and a half away from our home in Vegas. Camping close to home was our safety net – if camping with our baby didn’t go well, we could get home fast. And it was a good thing. Because here’s the spoiler: our first trip was an absolute fail and had to come home less than 12 hours into our camping trip. Between having a baby that didn’t want to sleep and temperatures over 85 degrees after the sun went down, we opted to tear down our campsite and head home. However, we learned so much on our short trip that we’d love to share with other parents who are attempting their first camping trips. Check out what worked and what didn’t below! When my husband and I picked a specific campsite to pop our tent, we thought we were doing well to make sure that it had a fire pit, a picnic table and a big, flat open area. What we didn’t think about was the campsite’s proximity to campground features. Shortly after getting all set up with our tent, we discovered that we had a water spigot right outside our tent window. 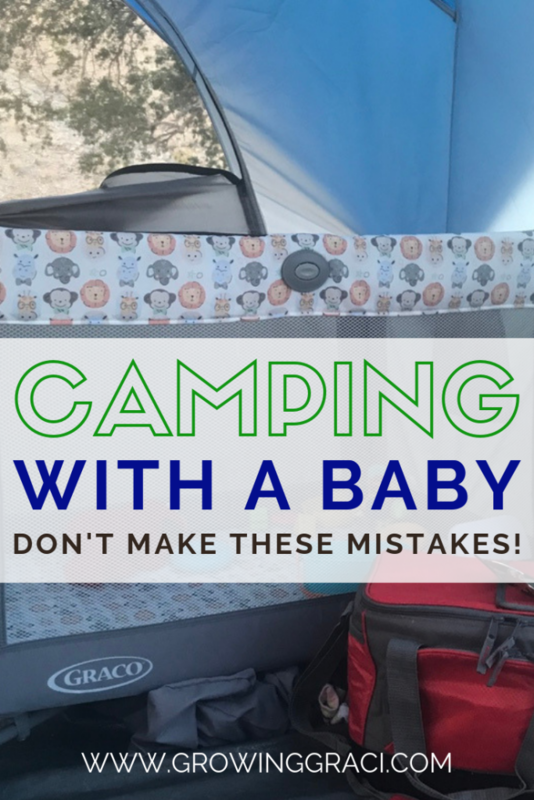 Although this was convenient for us, it posed a problem when it came to camping with our baby. All of our neighbor campers would come over to our site to get water, making noise right by where we were trying to settle our baby in the tent. Another issue that we had was that we picked a campsite near to the bathrooms. Again, this was convenient for us, but provided another noisy distraction for our baby who was used to a cool, quiet room to sleep in at home. Even if you do a great job of picking a campsite away from the noisy bathroom or away from other special “features” of the campground like water spigots, you should still look for the most secluded campsite that you can find. One of the biggest problems that we had during our short-lived camping trip was that we had very inconsiderate camping neighbors who played music loudly. This wouldn’t have been nearly as big of an issue if we hadn’t been camping with a baby. When you’re camping with a baby, the name of the game is to make them comfortable enough in a new setting that they can sleep. If your baby is used to sleeping in a quiet room at home, having rambunctious camping neighbors may prevent your little one from getting to sleep. Along the lines of baby sleep, it is important to bring comforts of home for your little one. While we felt like we had prepared extensively for our camping trip with our baby, the one thing that we didn’t think to bring was her soothing giraffe that plays music. This little toy is something that she sleeps with every night and at every nap time, and it might have really helped to settle her in the new setting. If your child is older, they may have a special item that they always gravitate towards. It may really come in handy to have items that make them comfortable when you’re on your new camping adventures. (In case you’re wondering what soother Graci absolutely loves, here it is! We have it in pink! I can be a bit of a germaphobe. To handle this, I usually have hand sanitizer and antibacterial wipes with me. When we go into a store, or go to a restaurant, I like to use my antibacterial wipes to clean the areas that Graci will be touching. However, when we went camping, you know what we didn’t think to stock up on? Sanitation supplies. Luckily, as I mentioned, I usually have hand sanitizer, bottle/binky wipes, and antibacterial wipes with me in my bag, so we had enough to get us through the time we were camping, but for future trips, we are going to be stocking up on a bunch. With a baby, you’re constantly using your hands to help them eat and to make them bottles. It is so important that you have access to something that will sanitize your hands. Even if your campground had a bathroom (ours did), you may experience a soap shortage (we did) or it may not be practical to run to the bathroom every time you need to wash. These are our favorite antibacterial wipes to have on hand. I’d also highly suggest bringing binky/bottle wipes along that you can use to wipe off bottles, binkies, or toys when they hit the ground. These have been our personal favorites. As any parent quickly discovers, babies require a lot of gear. One of the things that we got right on our ill-fated camping trip was that we opted to bring baby gear from home. The two baby gear items that we were sure to bring were our Pack ‘n Play by Graco and our Bumbo Multi-Seat. 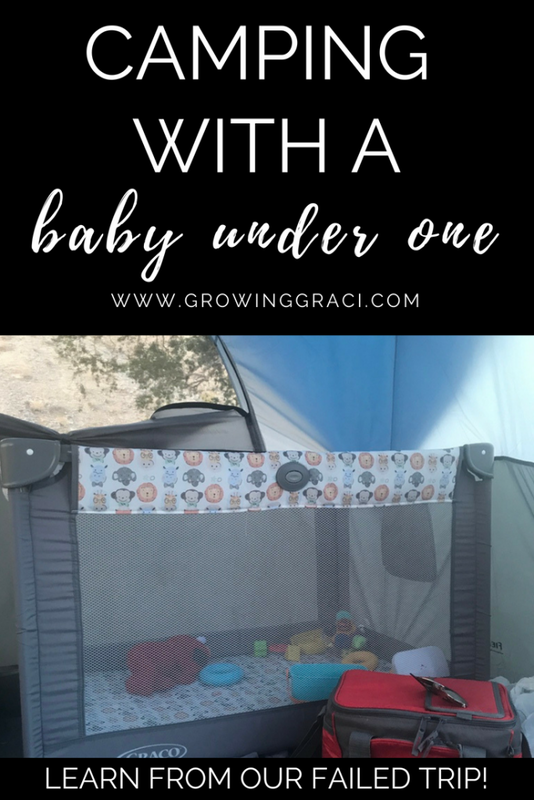 By bringing the Pack ‘n Play, we had a safe place to put our baby while our hands were full tending to the campsite. Plus, it doubled as a place for Graci to sleep. When we purchased our tent, we chose one that was large enough for our family to grow. So when we set up our tent, we placed the Pack ‘n Play on one side and our air mattress on the other. Unfortunately, I’m not able to link to our exact Pack ‘n Play on Amazon, but it is my honest belief that most Pack ‘n Play type of playards are pretty much the same. Check out what Amazon has to offer here! Let me know in the comments if you’ve had one that blew your mind! I’d love to hear! Before Graci was born, we decided that we were going to try and forgo a traditional high-chair. The Bumbo Multi-Seat straps onto any normal chair (one with a seat and back), comes with a tray that snaps on and has a seatbelt. There is a bottom to the seat that can raise the seat up several inches, and when your little one gets too big for the seat, you can remove the colored foam to make more room inside for your child. We have loved this seat so much for visiting family and at home for everyday use that we purchased a second one that we keep in the car. This was so handy for feeding our baby in our tent while we were camping. Instead of bringing a high-chair, we just placed this on the floor of the tent! Have you gone camping with a baby? What tips and tricks would you give to someone else? Let us know in the comments below!